I was glad not to be in a crushing crowd with too many bodies and not enough bathrooms. I was happy to have space and time to enjoy the interval leading up to the event, strumming on my ukulele and sipping on an icy beverage. We sat under the shade of the VW’s hatchback and taped halves of an extra pair of eclipse glasses to our camera lenses to protect our sensors from getting fried. I had no illusions that there was any life-changing impact from this phenomenon or pointless pagan rituals to follow. I was unencumbered by expectations of anything other than beauty. I was not disappointed. Even the sunrise on the way to our destination had a special sense of anticipation to it. Indeed, it was stunning. The last time I witnessed an eclipse, it was through a hole in a box we each made in grade school. I only recall it being rather anticlimactic. OooOOOoooh, a shadow. Whoopity-jinkies. This time, eclipse glasses gave me a new freedom to watch the progress in a position I was used to viewing normal things: with light and space. 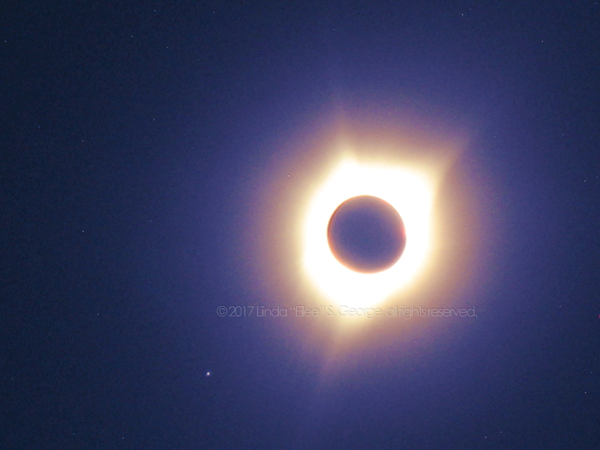 The news that I could slip off the glasses during totality (in areas where it actually occurred) was exciting, and I rushed to rip protective lenses off everything to get photos that way once we reached it. We had about two minutes plus, to fiddle around with things, and in my haste, I never even tried taking a picture with the tablet or the phone, preferring to stick to my camera with the zoom engaged. 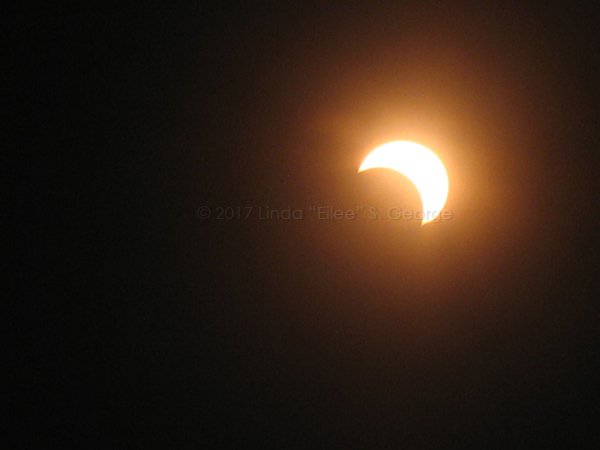 I even got some great pictures using the digital zoom – without a tripod (my hubby used it with my other camera) – I had alternately set up on the roof of his car, braced only on the rain guard over the sunroof. As if this weren’t spectacular enough for two photographers, there was the added treat of the way the atmosphere around us changed during totality – the shimmering silvery purple cast that settled all around us in an otherworldly filter between eye and world – every tree, flower, and person was a different color than I had ever seen and it cast a magical aura upon all denizens of the path. 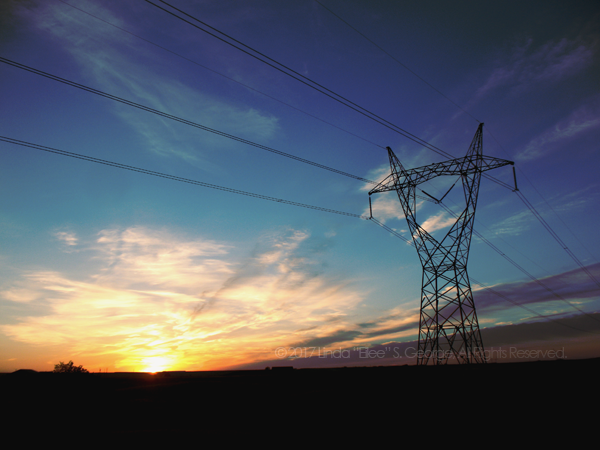 A colorful post-sunset twilight glowed on the horizon 360 degrees around us, as we never can witness otherwise. The sky didn’t blacken, but waxed to a starry indigo, showcasing planets and stars in a way few photos can convey – the headliners of the day aren’t divas; they share the limelight. Spectacles like this only emphasize to me how truly special God considers us to be. There is no way for me to deny the concept of Intelligent Design if I really think about all of the billions of miracles that happen every day – from the intricate interworking of the ecosystem and climate balance to the perfection of how the moon just “fits” perfectly in proportion to the sun many millions of miles away to give us such a show with just enough corona and time to enjoy it. It serves no practical purpose – it’s just a cast shadow when you get down to it – it doesn’t accomplish any useful task in the sight of the universe – except to fill a wee creature with enough mind to consider it with wonder. Sunsets didn’t have to be beautiful, nor kittens cute, nor birdsong inspiring – but they are – because He cared enough to make it so, and to design us to appreciate it. Berries didn’t have to be delicious, nor roses so aromatic, nor moss so soft, but for us to enjoy. Yes, there are other critters that expend their senses on these things, but they would anyway even if they were strictly utilitarian, as they do other things, and further, they indulge in some things that to us are outright repulsive. One may argue that some things don’t have such pleasant smells, flavors or tactile properties…but to that I point out that many of those things are that way for a different reason, such as to deter us from things that have spoiled, are poisonous, or may in other ways cause us harm: a concerned warning. Our earth revolves and orbits within amazingly narrow parameters that happen to sustain life. Other celestial bodies’ gravitational forces are just such that we are not obliterated. Flowers open at just the right time with just the right smell for just the right species to come along and pollenate in just the right geographical area. Trees get just enough light and water to photosynthesize just enough oxygen to sustain animal and human life on the planet, balanced with certain atmospheric requirements and minerals in the soil turned over by worms and the waste of other animals and many other factors put in place by our Creator. How absurd it is to me that anyone could possibly believe that all of this could coincide on a purely random basis. That takes far more of a stretch of faith than believing in God! One could believe in a Big Bang…but Who made the Big Bang? He Who designed each stunning eclipse. Specified complexity** is a marker of design by an intelligent source – it is sufficiently, significantly complex enough that it is highly improbably to occur at random, and specific enough to have to have been created for a given purpose. Combine millions of instances of this in the known universe, and it is impossible for all of them to have occurred by chance. Science, and faith in God, are not mutually exclusive. God created science; He created math; He created physics and created – or allowed to perpetuate following His initial creation – all that we see, hear, taste, touch, smell, know about, and still have yet to know. The scientific community has increasingly discredited Darwinism, and many scientists speak in terms of intelligent design – and of faith. They can’t escape it. Yet lesser minds persist in resisting. Some people think it’s insane to believe the world was made in six days (God rested on the seventh, remember?) or that the earth is only so many years old rather than what carbon dating or fossils say. I say: we have been wrong many times before. What makes this any different? We were convinced that we were right before, and our arrogance soon was exposed. Our technology now could just as easily be inaccurate. And we’re also ignoring the obvious: any Being, Who is capable of creating the UNIVERSE and of creating MAN and WOMAN in an already mature state, is also capable of creating other things in advanced states of evolution and development – including rocks and fossils and species. I wrestled with this myself, and as I did, I reasoned: Really, you aren’t going to try to limit the limitless, are you? That’s just your inadequate mind trying to make God as small as your limited imagination. He’s not subject to your shortsightedness; He made you! I can just see Him planting little bits of “evidence” to keep us busy for a while, perhaps to test our faith. If you think God doesn’t have a sense of humor, take another look at the duck-billed platypus. Don’t take yourself so seriously! Timothy Keller is one of my favorite authors, and is very adept at pointing out bulletproof logical arguments for the faith. In his book The Reason for God***, he relates a quip and draws a brilliant analogy that (one hopes) resets a closed, limited mind to one that confronts the fact that we don’t know it all. I lent my copy to someone, so I will have to paraphrase it. A Russian cosmonaut (atheist) returned from space and proclaimed tersely that he “didn’t see God” while up there. Keller, always on point, countered that the cosmonaut’s assertion that this was any kind of “proof” of the nonexistence of God was akin to Hamlet going up to his attic and claiming he didn’t see Shakespeare. The point being: the character (Hamlet) could never have any idea of the existence of the author (Shakespeare) except what Shakespeare chose to write into his character’s consciousness. Hamlet’s obliviousness to his creator’s existence bears exactly zero relationship to the very real fact of Shakespeare existing. Shakespeare would exist regardless of whether or not he ever wrote himself into the play or into the mind of Hamlet. Likewise, our attempted denial of God, based on our own ignorance, cannot negate His existence. The creation is never greater than the creator. The creation only exists on the whim and graciousness of the creator. The creation had best get his mind right and his facts straight. My paintings aren’t greater than I am. They would not exist were it not for me. They aren’t even equal to me. They can’t do what I do. I make them; I can change them; assign them; destroy them. They portray things because I design them that way. But my art analogy doesn’t have legs…I can make mistakes. I can make a dud painting, flat out. It’s not the painting that made itself go wrong. God makes mankind in His own image – but gives man free will. Man chooses wrong; man screws up. Man sins against himself and against others. Sometimes he doesn’t even mean to. Man is imperfect. But God is perfect, and doesn’t make mistakes. We make them. Sometimes that mistake is that we make a “god” out of ourselves, and deny Him. But that has no bearing on His existence. God is evident in the instinctual physiological response of mothers to the sound of crying offspring. God is evident in the intricate function of a human eye. None of this is the result of random chance. It is too complex and too specifically pertinent to the successful function and survival of a certain species in a particular environment. Evolution does not explain the origin of any development to this stage. Someone designed that from which it evolved. And it is more than possible that the path of evolution itself is designed and directed by that Being. And Someone designed our moon to be just the right size to just block most of the sun when viewed from our Earth, and the moon’s orbit within the same plane as Earth orbits the sun so its shadow will intersect our sight (remember, Neptune’s moon Triton’s orbit is not parallel to the same plane – so our own moon’s orbit didn’t have to be either). He made everything line up in such a way that when we are perfectly lined up with it, that we can stare at the spectacle for two minutes straight without our sensitive eyes going blind, and marvel at a rare, unique beauty. Talk all you want to about how colors are caused by bending of light waves and elements in the atmosphere – He created all of that! And He designed us to respond to it with fear, wonder, joy, curiosity and a desire to know more. What a priceless gift. 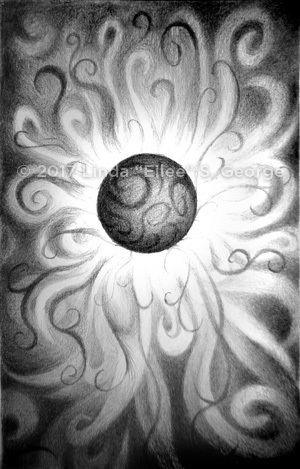 On the way home, in the limitation of a simple pencil, I tried to describe the abstract beauty of the eclipse in my own God-given manner. My self-expression may have evolved of its own nature and my intent, but the underlying passion fueling my art was born as my received gift from Him. And to Him I am ever grateful. * I rarely show my photography, but thought this a rather special occasion. I have plenty more, and far higher-resolution prints than the images you see here (with more discreetly placed watermarks) are available to order. 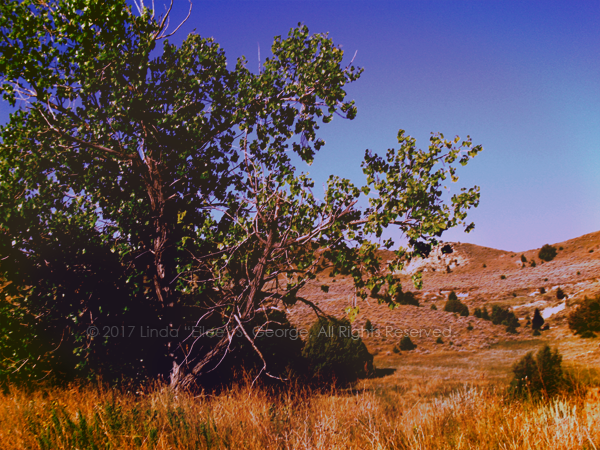 This entry was posted in Anecdotes & Musings and tagged Faith, Finding my-no-HIS Way, Photography on January 22, 2018 by Aiii.